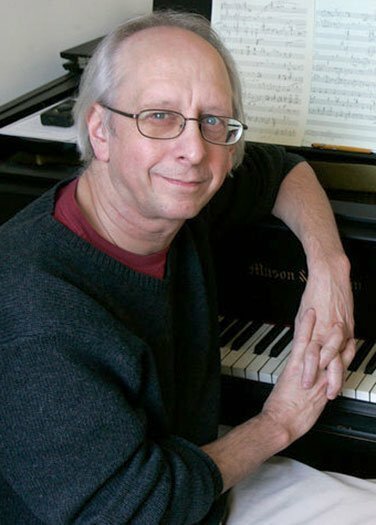 Jordan Hall resounded last night with the music of Lee Hyla, who taught composition at New England Conservatory (his alma mater) from 1992 until moving to Northwestern University in 2007. Hyla died early this summer at the age of 61, and this concert memorialized him with performances of his compositions for diverse instruments. Lauded during his lifetime, Hyla worked with a multitude of musicians, and many who premiered his compositions were at Jordan Hall last night. This concert featured the Firebird Ensemble, the Callithumpian Consort, and the Lydian String Quartet, individuals from these ensembles in different configurations, as well as Judith Gordon (piano), Yoko Hagino (piano), Jessi Rosinski (flute & alto flute), and Thea Lobo (mezzo-soprano), in pieces composed between 1989 and 2013. The program presented a compelling portrait of Hyla’s distinctively eclectic compositional voice, his idiomatic gestures, and recurrent fascinations. Stephen Drury opened with Basic Training (1994), a 13-minute piano work which began with a Whitmanesque mighty yawp, nodding towards jazz syncopations and left-hand heavy blues before turning introspective. It passed through a loudly dancing section reminiscent of Prokofiev before revisiting the opening tone then quickly sinking into a softer resonance. This gave a fitting start to the concert and introduced a recurring structural pattern that we heard in several examples: simple, slow, quiet building in intensity and depth, turning introspective, then revisiting the opening gestures. The language is hardly basic and is a training piece only insofar as it is a Vademecum, a compendium, of technique. Drury gave a masterful reading of this Basic Training, which was written for him as a tribute to Spokane-based piano teacher Margaret Ott. Violinist Gabriela Díaz took the stage for Passeggiata (2007). In six minutes it walked through the chronology and history of solo violin literature, Bach to fiddle; Díaz’s singing tone and dancing rhythm brought it to vibrant life. The Firebird Ensemble offered Field Guide (2006), a ten-minute chamber work drawing inspiration from birdsong (a font to which Hyla returned often). The notes described the derivation of much of the thematic material from the Cornell Ornithological Labs CD compilation of birdsong; based on this I expected something Messiaen-esque, but Hyla produced something in the vein of experimental jazz for combo. At the end the sounds of bird calls are more obvious. The whole is catchy and tuneful. Judith Gordon played Third Party (1998), an inventive seven minutes for solo piano. Requiring hands both on the keyboard and on the strings, it created a lush soundscape full of great interest and deserving of a wider airing. Commissioned to precede Liszt’s Sonata in B Minor, but stood-alone here; its world of possibilities does not need that sonata to inspire frissons of awe. Gordon gave an exciting reading and the combination of familiar and atypical piano sounds was mesmerizing. The one-movement, 13-minute String Quartet No. 3 (1989), written for and performed by the Lydian String Quartet (Daniel Stepner & Judith Eissenberg, violins; Mark Berger, viola; Joshua Gordon, cello), rounded out the first half of the concert. Ranging from simple to gnarly, harmonically transparent to dense, this is rich and multi-faceted, reminiscent of Bartók yet never derivative —here as elsewhere, wholly Hyla. The Callithumpian Consort with Thea Lobo, mezzo-soprano started the second half with Migración (2013), a ten minute setting of a Pablo Neruda poem. The text is dense and elliptical; the allusions to birds brought out Hyla’s fascination with their songs, but the words repay multiple re-readings and may always prove inexhaustible in meaning. Lobo sang with crisp enunciation and spoke the middle section in a firm voice; she has a pleasing tone and stage presence. Lobo and Drury’s Consort conveyed great sensitivity. Sarah Brady (flute) and Yoko Hagino (piano) contributed Warble (2008), eight minutes of flute with intermittent piano collaboration. This captures the thrill and exuberance of birdsong while calling upon the full range of the flute and of flautist to sing across the technical challenges. This duo gave an affective reading. Sarah Bob offered “Solo cadenza” from My Life on the Plains (2010/2012). The original My Life on the Plains (the name being that of General Custer’s autobiography) is for seven players in three movements over 25-minutes. With Hyla’s blessing, Sarah Bob, pianist with the Firebird Ensemble, compiled the virtuosic solo and chamber passages for piano—many, again, inspired by bird calls—into five minutes for solo piano. From the 2010 chamber work comes this 2012 solo piece, which Bob told us does not alter Hyla’s original notes. To its everlasting credit, this rendition does not sound like excerpts: Hyla/Bob makes a compelling argument of its own, calling forth a variety of touches and techniques. Bob brought out the complementary voices across the full dynamic range and compass of the instrument. Jessi Rosinski (flute & alto flute), Gabriela Díaz (violin), David Russell (cello), and Stephen Drury (piano) concluded with Ciao, Manhattan (1990). Like Basic Training, its eight introspective minutes written while Hyla was resident in New York and in Rome, expand out from a simple, transparent, opening; starting as an elegiacal nocturne full of unexpected colors from the dampened piano, alto flute, muted violin, and cello harmonics, it grows in complexity before returning to a thinner texture. I found myself recalling the early Georgia O’Keeffe paintings of Manhattan street scenes at night; they are kindred spirits with this music. The execution was solid and exciting. Exceptional performers and astute readings produced a touching and fitting tribute to a musical voice too soon lost.